…and I wish I can share my instagram video on my blog like you. Thanks Novroz. All I did to share my video was go to the desktop Instagram website version ~ and mouse over your video, bottom corner and the option to embed should come up. beautiful rainbow colors. The yellow and blue is my favorites. Thank you Rhonda! 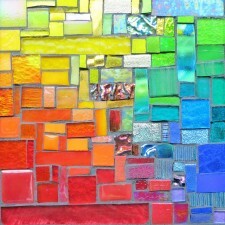 I don’t do a lot of yellow in my mosaics, but I love the yellow section of the rainbow!